A tricky roguelike RPG inspired by tabletop games, but it's easy to like. 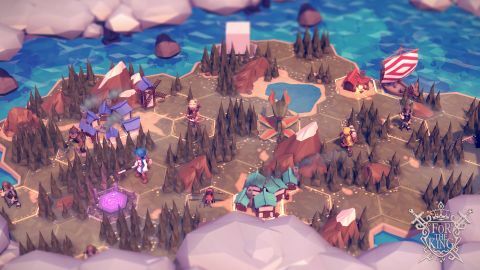 A sometimes tricky RPG with gorgeous art that's perfect for co-op. What is it? A tabletop-inspired roguelike RPG requiring challenging strategy to master. A trio of misfit fantasy adventurers set off into a fairytale world to right the wrongs that have befallen their kingdom, lest the forces of darkness and chaos claim their world. For the King’s typical setup belies a charming, tough, tactical game with a bunch of painful ways to die. Taking lessons from the best of tabletop adventure and roleplaying games, For the King looks unique and has simple systems that create a lot of complex and emergent strategies. Varied weapon types, classes, and a lot of unlockables make it a light RPG with strong replayability—it simply gets more fun each time I play it. Plus, it’s better in co-op. After a few hours of play I was in love with its art. It’s a goofy dungeon romp personified, with the kind of playful character that has become so popular in Dungeons & Dragons actual play podcasts. Characters and enemies ragdoll hilariously when defeated, flopping about the battlefield in a splash of blood and spray of extraneous bones. Near every single piece of equipment is rendered on your character, and they range from grim dungeonpunk fantasy to a frilly pink princess hat. For the King exudes lightness and humor. Watching a jester’s cap and plate mail wearing wizard slam a roc with a fireball before it flops across the screen into some boulders, all the while scattering cartoonish bones and blood, made me laugh over and over. The comedy takes the sting out of what is often a difficult, ruthless game. In each of For the King’s three campaigns you set off across the randomly generated kingdom to delve into dungeons, kill creatures, and travel between towns. A party is made up of three heroes controlled individually by one to three players cooperatively—and cooperatively is by far the best way to play. In each round your characters take turns moving independently across overworld hexes, avoiding or fighting enemies and finding random encounters to attempt—like climbing a cliff to get at a shiny sword or sauntering through a field of lucky clovers. Spreading out and exploring is vital to success, as you’ll often have competing priorities to accomplish. Combat is turn-based, much like a JRPG, with characters taking alternating swipes at each other based on their speed stat. Fights aren’t always fair, however, as characters can only support each other in battle if they’re within a handful of hexes from the fight—so a surprise ambush can be deadly. Most actions in the game are resolved by rolling a number of 100-sided dice against your statistics, which usually range from 70-90 in what each character is good at, but are as low as 40 in what they’re bad at. Focus, a limited resource replenished by resting, can be spent to guarantee a success in a roll. I hoarded focus, making sparing use of it to guarantee tough fights or make the best of random encounters with no good outcomes. Death is harsh, and reviving downed characters is a limited resource replenished only by finding and destroying secret cult lairs. Lose all your heroes and it’s over. During all of this, timed events will come rolling down the turn tracker at the top of the screen, and the heroes have to foil them. At first it’s simple increases in chaos, which make the world more and more dangerous, but there are looming disasters to prevent as well—like a volcano wizard who summons destructive mountains to alter the world or a vicious leprechaun who sometimes steals your items. Much of For the King is about ensuring that you keep up in power level as the world gets more dangerous—which is hard, because constant fights for XP will place a strain on your resources when you need to accomplish a goal or enter a dungeon. Where For the King truly shines in the co-op. It really mimics the feel of a tough co-operative tabletop game, one where you fight with the game for each inch of success. I think it even compares favorably to modern hits in the adventure genre, like Legends of Andor. Successful strategies required brain-burning coordination and problem solving skills that consider every available resource and factor, and distributing that work across multiple collaborating players was very satisfying. I found that I had the most fun with For the King when playing co-op. Parsing its tactical challenges and puzzles was simply less fun alone. It’s a tactical system that rewarded me for mastery. Knowing when to take a fight or when to avoid it is the simplest layer of this. Later, I found myself considering how to best chain together a handful of fights that would bring me close to a town just as I leveled up, enabling me to rest my characters and regain their resources, before deploying one of my precious portal scrolls to jump me to a disaster or dungeon halfway across the region just before it became a serious problem. This mastery, however, comes at a price: Your time. You’ve got to know the abilities of all those enemies to know you can fight them in a chain. You’ve got to know the precise prices of resting and recuperating before you hit that town. You’ve got to know you can take that dungeon at your level before you dive in. I learned almost all of those things by having failed at them, often disastrously, in a previous playthrough. That’s a level of play-to-lose learning that many players are not going to have fun undertaking. Unfortunately, because much of that learning is iterative—an imp in the late game requires strategies much like an imp in the early game—I failed the most in the early sections. Some of the lessons I learned were frustrating and unintuitive, like going into dungeons as soon as they appeared rather than outleveling them for sure victories, while others were simply frustrating, like monsters that have abilities to drain some of your precious focus. Once I was over the humps I felt invincible, and mostly was. For the King definitely lets you exult in your mastery, and the last sections of the game can feel like a victory lap—albeit a hard earned one.